The scientist and philosopher Rudolf Steiner discovered that besides 'ordinary' space there is 'negative' space, or 'counterspace', which relates to a holistic conception of the world. 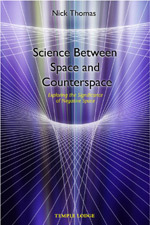 Steiner suggested that it was important to understand counterspace as a necessary supplement to the conventional approach. His colleague George Adams found a way of describing counterspace through mathematics.